You know, if I had a more ridiculous life, my blog posts might be more interesting. Like maybe the Hot Dog Mobile needs to be driving next to me on the interstate every once in a while. Or maybe I could share a check-out lane at Walmart with one of those fat guys wearing a t-shirt with naked abs printed on it. I mean, would it kill The Bachelor to have a fantasy date in my hometown just one time? But no. Instead I pee my pants after running half a block. I read books out loud and in a British accent, even the Southern fiction ones. And I can fold my tongue back on itself and make it stick. Those are the things I can share in this blog. Interesting to NO ONE. Yes, Sample Society is no longer. It has now transitioned to the Allure Beauty Box. Price is the same ($15) and contents are the same, so nothing at all has changed. I don’t know why I was expecting a bit of fanfare. It’s in my nature to be optimistic I guess. First thing in the box is the Oscar Blandi clear dry shampoo. I have received a sample of this before and you can read the review here if you’d like. I don’t prefer the clear powder but I know lots of brunettes who do. In my brain, white powder means it’s working. Actually, the more white powder the better. I don’t care if it makes my roots look gray; my roots aren’t greasy and that’s all that matters. So I can appreciate the idea behind the invisible powder – not everyone has greasy roots that need mattified – but for me personally, it’s white powder all the way. It’s been awhile since I’ve used a really great mascara. Or a NEW really great mascara, as I have plenty of old (i.e., expired) great ones in the stash. This Estee Lauder Sumptuous Infinite Length + Volume mascara is a real gem. It does exactly what it says: lengthens nicely and plumps up my puny lashes so so so so good. I seriously used this every single day for two weeks straight. It’s been a really long time since I’ve done that. It may be partly cuz my makeup collection has now spilled out of its acrylic drawer confinement and took up residence right in front of the mascara drawer – which means I’d have to physically move it all in order to open the drawer to get out a different mascara. That is the equivalent to dusting and sweeping underneath your lamps and knick knacks: NOBODY DOES THAT. So most likely I’ll be using this tube of mascara until the day I die. Oh well, at least it’s a good one. I would agree about the texture. This eye serum is really nice. It absorbs fast and leaves behind some very silky skin. I just recently finished the eye cream (literally like a week ago) and I’d say the eye cream is a slightly better product than the serum. The serum is a thin lotion while the cream is a more emollient gel, which I prefer. They both sink into the skin very fast and have an amazing soft texture, but if I’m forced to choose I’d have to go with the cream. But I’m never forced to choose. That’s why I have an unhealthy cache of skincare living underneath my bathroom sink. Just buy ALL OF IT. That’s my advice. Next up is the Bumble and Bumble Hairdresser’s Invisible Oil Primer. You all know I’m not really into hair products since I have no hair routine whatsoever. Seeing that I wash my hair twice a week and only use a flatiron, I don’t have much use for styling creams, gels, mousses or spritzes. So you can imagine my thrill at seeing this in the box. However, I read up on it (like a proper blogger) and this primer might deem to be useful. It claims to soften, detangle, de-frizz, tame flyaways, ease styling and protect against breakage, heat and UV damage. That’s a lot of stuff – and good stuff that my hair could use. I do have tangly hair that tends to get frizzy and break easily, plus a heat protectant is probably pretty important. I tried it once and nothing bad happened, which is also pretty important . No scummy film left behind and no sticky-up hair scenario ensued. Ugh. Fiiiiine. I’ll keep it. But just this one time. Got the Supergoop! Setting Mist. I’ve been using setting sprays a lot recently and not really sure why. Maybe it’s because I keep buying them and now have a tiny little hoard taking up residence on the bathroom counter – and they won’t go away unless I use them. Cuz honestly, I don’t actually know if I’m getting any benefit out of a setting spray. Do they really help your makeup stay on longer? Dunno. Do they take away the look of powder and cakey-ness on your face? Dunno. Do they make you feel like you could operate your own YouTube channel because you bought one (or seven)? Yes, absolutely. The pump is weird. It sprays very harshly out of the bottle and hits your face hard. It doesn’t give you a nice little misting but almost a punch right in the eyeball. I have the sample size so not sure if the full size does the same thing, but that’s just note #1. Note #2 is the smell. It’s supposed to be a refreshing rosemary, but I swear it smells like sunscreen. Not necessarily bad unless you aren’t a fan of that smell. Note #3 is the finish. It goes on sort of dry. It’s wet when it hits your face but evaporates almost immediately. And you look very matte – or at least I did. As far as the oil control claim, I didn’t detect any kind of miracle. I still had to blot about the same time as I do every day. I suppose the most important question is would I purchase it again. The answer is yes. I think this would be a very convenient way to get some sun protection without jacking up your makeup. Since it doesn’t leave your face wet, it’s perfect for any time of day. Plus it comes in two sizes, and the 1oz size would be perfect for your purse. Well, not my purse because it’s full of 27 lipglosses, blotting papers, retractable blush brush, cuticle oil and industrial strength hand sanitizer that kills the stomach flu. But for normal people, this should work just fine. 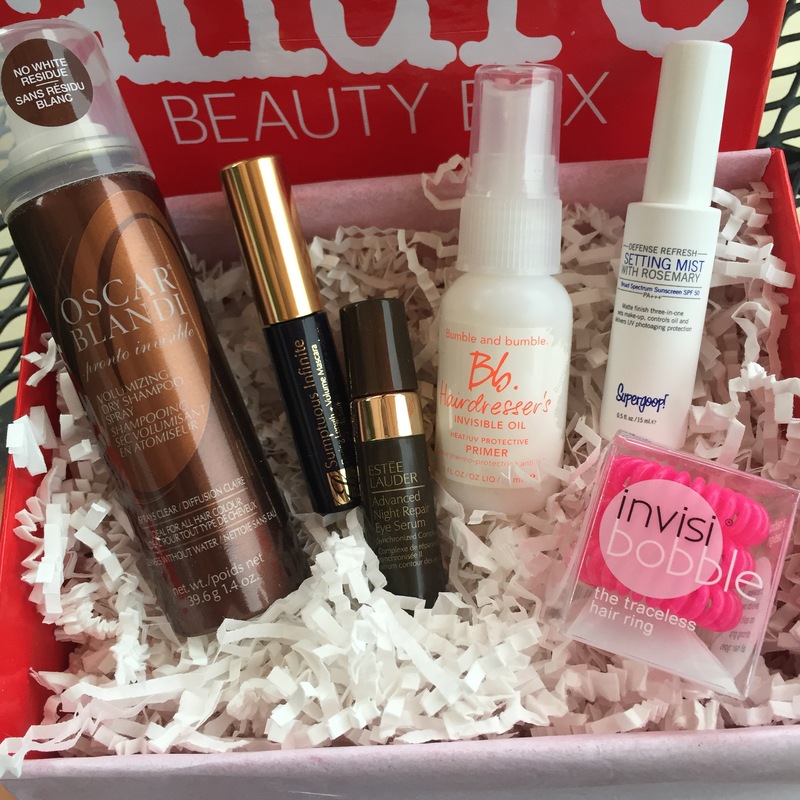 Last item in the box is the InvisiBobble traceless hair ring. It’s a hair tie disguised as an old telephone cord. The idea behind it is to secure the hair without leaving a dent in it, even in very fine hair. I have fine hair and almost everything leaves a dent. I can pull my hair up in a clip, take a 20 minute bath, and there’s a dent right afterward. So I was very excited to try this product. However, I didn’t like it as much as I thought I would. Yes, it works. But if you want a high and tight ponytail, this will not provide. It pulls your hair back limply. It stays in and doesn’t lose position, but it does not do the same thing a regular hair tie will do. On the upside, it truly does not leave a dent which is good if all you really want is your hair pulled off your face loosely. But if you want to look like a stern business woman who just had an eye lift (obviously my go-to) then you are S.O.L. with this thing. And that’s it! Once again, thanks for reading my little blog and for following me on Instagram and liking all my pictures and whatnot. One of these days when I get rich and famous, I’m going to come give every one of you hugs, kisses and REAL high fives (not just internet ones). So to speed that along, go ahead and share this post (and all others) on your own social media. I give you permission. There’s a share button down there somewhere. Click it. Thanks.